For thousands of years, astronomers wrestled with basic questions about the size and age of the universe. Does the universe go on forever, or does it have an edge somewhere? Has it always existed, or did it come to being some time in the past? In 1929, Edwin Hubble, an astronomer at Carnegie Observatories, made a critical discovery that soon led to scientific answers for these questions: he discovered that the universe is expanding. The ancient Greeks recognized that it was difficult to imagine what an infinite universe might look like. But they also wondered that if the universe were finite, and you stuck out your hand at the edge, where would your hand go? The Greeks' two problems with the universe represented a paradox - the universe had to be either finite or infinite, and both alternatives presented problems. After the rise of modern astronomy, another paradox began to puzzle astronomers. In the early 1800s, German astronomer Heinrich Olbers argued that the universe must be finite. If the Universe were infinite and contained stars throughout, Olbers said, then if you looked in any particular direction, your line-of-sight would eventually fall on the surface of a star. 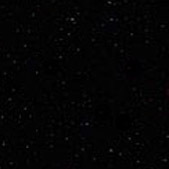 Although the apparent size of a star in the sky becomes smaller as the distance to the star increases, the brightness of this smaller surface remains a constant. Therefore, if the Universe were infinite, the whole surface of the night sky should be as bright as a star. Obviously, there are dark areas in the sky, so the universe must be finite. But, when Isaac Newton discovered the law of gravity, he realized that gravity is always attractive. Every object in the universe attracts every other object. If the universe truly were finite, the attractive forces of all the objects in the universe should have caused the entire universe to collapse on itself. This clearly had not happened, and so astronomers were presented with a paradox. When Einstein developed his theory of gravity in the General Theory of Relativity, he thought he ran into the same problem that Newton did: his equations said that the universe should be either expanding or collapsing, yet he assumed that the universe was static. His original solution contained a constant term, called the cosmological constant, which cancelled the effects of gravity on very large scales, and led to a static universe. After Hubble discovered that the universe was expanding, Einstein called the cosmological constant his "greatest blunder." At around the same time, larger telescopes were being built that were able to accurately measure the spectra, or the intensity of light as a function of wavelength, of faint objects. Using these new data, astronomers tried to understand the plethora of faint, nebulous objects they were observing. Between 1912 and 1922, astronomer Vesto Slipher at the Lowell Observatory in Arizona discovered that the spectra of light from many of these objects was systematically shifted to longer wavelengths, or redshifted. A short time later, other astronomers showed that these nebulous objects were distant galaxies. Meanwhile, other physicists and mathematicians working on Einstein's theory of gravity discovered the equations had some solutions that described an expanding universe. In these solutions, the light coming from distant objects would be redshifted as it traveled through the expanding universe. The redshift would increase with increasing distance to the object. In 1929 Edwin Hubble, working at the Carnegie Observatories in Pasadena, California, measured the redshifts of a number of distant galaxies. He also measured their relative distances by measuring the apparent brightness of a class of variable stars called Cepheids in each galaxy. When he plotted redshift against relative distance, he found that the redshift of distant galaxies increased as a linear function of their distance. The only explanation for this observation is that the universe was expanding. Once scientists understood that the universe was expanding, they immediately realized that it would have been smaller in the past. At some point in the past, the entire universe would have been a single point. This point, later called the big bang, was the beginning of the universe as we understand it today. The expanding universe is finite in both time and space. The reason that the universe did not collapse, as Newton's and Einstein's equations said it might, is that it had been expanding from the moment of its creation. The universe is in a constant state of change. The expanding universe, a new idea based on modern physics, laid to rest the paradoxes that troubled astronomers from ancient times until the early 20th Century. The equations of the expanding universe have three possible solutions, each of which predicts a different eventual fate for the universe as a whole. Which fate will ultimately befall the universe can be determined by measuring how fast the universe expands relative to how much matter the universe contains. 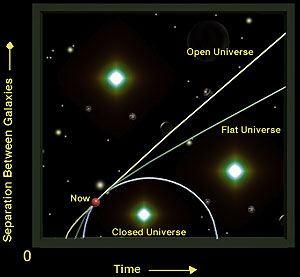 The three possible types of expanding universes are called open, flat, and closed universes. If the universe were open, it would expand forever. If the universe were flat, it would also expand forever, but the expansion rate would slow to zero after an infinite amount of time. If the universe were closed, it would eventually stop expanding and recollapse on itself, possibly leading to another big bang. In all three cases, the expansion slows, and the force that causes the slowing is gravity. A simple analogy to understand these three types of universes is to consider a spaceship launched from the surface of the Earth. If the spaceship does not have enough speed to escape the Earth's gravity, it will eventually fall back to Earth. This is analogous with a closed universe that recollapses. If the spaceship is given enough speed so that it has just enough energy to escape, then at an infinite distance away from the Earth, it will come to a stop (this is the flat universe). And lastly, if the ship is launched with more than enough energy to escape, it will always have some speed, even when it is an infinite distance away (the open universe). For the last eighty years, astronomers have been making increasingly accurate measurements of two important cosmological parameters: Ho - the rate at which the universe expands - and w - the average density of matter in the universe. Knowledge of both of these parameters will tell which of the three models describes the universe we live in, and thus the ultimate fate of our universe. The Sloan Digital Sky Survey, with its large systematic measurement of the galaxy density in the Universe, should enable astronomers to precisely measure the density parameter w.
Astronomers are not only interested in the fate of the universe; they are also interested in understanding its present physical state. One question they try to answer is why the universe is primarily composed of hydrogen and helium, and what is responsible for the relatively small concentration of the heavier elements. With the rise of nuclear physics in the 1930s and 40s, scientists started to try to explain the abundances of heavier elements by assuming they were synthesized out of primordial hydrogen in the early universe. In the late 1940s, American physicists George Gamow, Robert Herman, and Ralph Alpher realized that long ago, the universe was much hotter and denser. They made calculations to show whether nuclear reactions that took place at those higher temperatures could have created the heavy elements. Unfortunately, with the exception of helium, they found that it was impossible to form heavier elements in any appreciable quantity. Today, we understand that heavy elements were synthesized either in the cores of stars or during supernovae, when a large dying star implodes. Gamow, Herman, and Alpher did realize, though, that if the universe were hotter and denser in the past, radiation should still be left over from the early universe. This radiation would have a well-defined spectrum (called a blackbody spectrum) that depends on its temperature. As the universe expanded, the spectrum of this light would have been redshifted to longer wavelengths, and the temperature associated with the spectrum would have decreased by a factor of over one thousand as the universe cooled. In 1963, Arno Penzias and Robert Wilson, two scientists in Holmdel, New Jersey, were working on a satellite designed to measure microwaves. When they tested the satellite's antenna, they found mysterious microwaves coming equally from all directions. At first, they thought something was wrong with the antenna. But after checking and rechecking, they realized that they had discovered something real. What they discovered was the radiation predicted years earlier by Gamow, Herman, and Alpher. 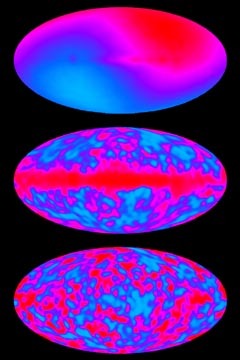 The radiation that Penzias and Wilson discovered, called the Cosmic Microwave Background Radiation, convinced most astronomers that the Big Bang theory was correct. For discovering the Cosmic Microwave Background Radiation, Penzias and Wilson were awarded the 1978 Nobel Prize in Physics. After Penzias and Wilson found the Cosmic Microwave Background Radiation, astrophysicists began to study whether they could use its properties to study what the universe was like long ago. According to Big Bang theory, the radiation contained information on how matter was distributed over ten billion years ago, when the universe was only 500,000 years old. At that time, stars and galaxies had not yet formed. The Universe consisted of a hot soup of electrons and atomic nuclei. These particles constantly collided with the photons that made up the background radiation, which then had a temperature of over 3000 C.
Soon after, the Universe expanded enough, and thus the background radiation cooled enough, so that the electrons could combine with the nuclei to form atoms. Because atoms were electrically neutral, the photons of the background radiation no longer collided with them. When the first atoms formed, the universe had slight variations in density, which grew into the density variations we see today - galaxies and clusters. These density variations should have led to slight variations in the temperature of the background radiation, and these variations should still be detectable today. Scientists realized that they had an exciting possibility: by measuring the temperature variations of the Cosmic Microwave Background Radiation over different regions of the sky, they would have a direct measurement of the density variations in the early universe, over 10 billion years ago. variations of the background radiation. In 1990, a satellite called the Cosmic Microwave Background Explorer (COBE) measured background radiation temperatures over the whole sky. COBE found variations that amounted to only about 5 parts in 100,000, but revealed the density fluctuations in the early universe. The initial density variations would be the seeds of structure that would grow over time to become the galaxies, clusters of galaxies, and superclusters of galaxies observed today by the Sloan Digital Sky Survey. With the Sloan data, along with data from COBE, astronomers will be able to reconstruct the evolution of structure in the universe over the last 10 to 15 billion years. With this information, we will have a deep understanding of the history of the universe, which will be an almost unbelievable scientific and intellectual achievement. But measuring the evolution of the density variations in the universe still does not answer the most important question: why does the universe contain these differences in density in the first place? To answer this question, astronomers and astrophysicists must understand the nature of the density variations and construct theories of the origin of the universe that predict how these variations should occur.